The Gannon University women’s volleyball team saw its successful season come to an unexpected end Friday night, as the Knights lost to Seton Hill, 3-2, in the semifinals of the NCAA Division II Atlantic Regionals in Wheeling, W. Va. It marked the second time in less than a week that the Knights were beaten by the the Griffins, as they defeated Gannon in the finals of the Pennsylvania State Athletic Conference Tournament the previous weekend at the Hammermill Center. 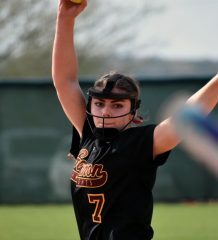 Saturday’s regional loss ended Gannon’s season and left the Knights with a 31-3 record. At a postgame press conference, Gannon coach Matt Darling acknowledged it was a tough loss and said he hopes it will motivate his young team to “pay attention to the little things” next season. “My hope is that this motivates us to pay attention to the little things,” said Darling, whose 16-player roster featured 12 players who were either freshmen or sophomores. Darling said people have congratulated him and his team on a good season. Gannon entered the regional tournament as the No. 2 seed and opened play by sweeping No. 7 seed Shepherd Thursday. 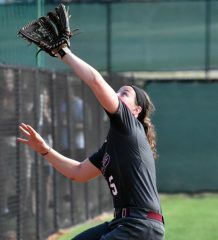 That put the Knights into Friday’s semifinal, and for a while at least it appeared as though Gannon would earn a berth in Saturday’s regional final. Gannon got off to a quick start, scoring six of the first eight points in the opening set. Seton Hill responded with the next three points before eventually taking a 10-9 lead. After several SHU attack errors and kills from Ashley Kerestes and Ashley McClung, Gannon stretched its lead to 23-18. Lexi Johnson and Lauren Sampson combined for a block and the Knights sealed the opening set with a kill from Sampson for a 25-19 set victory. Gannon continued to play well in the second set. Toni Leitshuh opened the set with an ace and Kerestes, McClung and Smith all followed with kills that pushed Gannon to a 14-7 lead. A 4-1 run by Seton Hill kept things close in the second set as Gannon led 20-17. Ally Smith put down a kill to give Gannon a 24-18 lead but the Griffins cut the Knights’ lead to 24-22. Smith eventually closed the set with a kill for a 25-22 win for the Knights. The teams battled evenly through the early going of the third set, as the score was tied 13-13 at one point. Eventually, the Griffins worked their way back using a 5-1 run to take a 19-17 lead. Seton Hill ultimately claimed victory, 25-23, with two of its final four points coming on Gannon service errors. Seton Hill opened the fourth set on a 7-2 run, but Gannon used a 6-2 run to pull within three points at 15-12. But the Griffins opened up a 21-13 lead by scoring six of the next seven points, and they held on for a 25-21 win to even the match at two sets apiece. Seton Hill again got off to a quick start in the deciding set, building a 6-2 lead. The Knights reeled off four of the next five points to tie the fifth set at eight. But Seton Hill scored four of the last five points to claim the victory and end Gannon’s season. Sampson finished with 17 kills while McClung added 15 to go with 30 assists and Smith and Kerestes each contributed 12 kills each. The Knights were hurt by 21 service errors; Seton Hill committed just three. In Thursday’s quarterfinal win over Shepherd, Gannon built a 16-10 lead in the first set en route to a 25-18 victory. In the second set, Gannon opened with a 10-5 lead, and kills from Johnson and McClung put Gannon up 21-18 on the way to the set victory, 25-23. The Knights claimed the match with a 25-19 victory in the third set. Sampson was the only Knight player in double-digits for kills with 11 while Smith and McClung each finished with eight.